The Good: Mystery did the first step in the rise of pickup. He tried to give a general overview about seduction. The Bad: His system - the mystery method - is extremely(!) complicated and totally hard to implement. He stands on the roots to overcomplicate seduction and brings it to a similar level as the rocket science. I can only recommend the fundamentals of dating in this books but not the method itself. 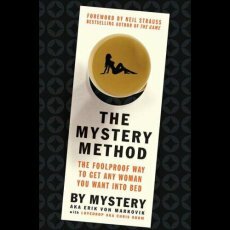 I know that is only my personal meaning but I found the method in this book horrible and wouldn't recommend it to anyone. It made me totally confused and insecure about dating because I again and again had the feeling I have to master seduction like it stand in this book because everybody said it is so crucial in dating. But I never nearly got the deeper idea behind all the concepts and I also missed the effectiveness of it even after a decent amount of going to bars and clubs. I prefer much more the direct game style which in my eyes is 1000x easier and less complicated than the mystery method and also more effective. Still toady I have to reorder my mind about pickup because of this book. Because it is in my opinion so difficult to implement it is nothing for beginners because they need something easier to get results.